It's 22:48 in New York City, USA right now. Pier Cam A view of Manhattan from Pier A on the Hudson River in Hoboken, New Jersey. New York City, New York: Haze Cam, 0 miles away. New York City, New York: HD Stream Skyline Manhattan, 0 miles away. New York City, New York: New York City Skyline, 0 miles away. New York City, New York: 42nd Street, 0 miles away. Weehawken, New Jersey: Livestream Skyline Manhattan, 2.1 miles away. 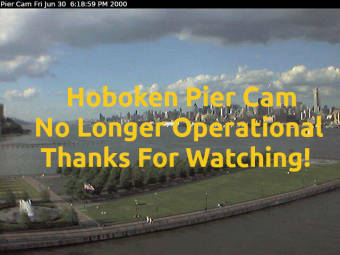 Hoboken, New Jersey: HobokenWeather.com WeatherCam, 2.5 miles away. Jersey City, New Jersey: Hudson County School of Technology, 5.5 miles away. Fort Lee, New Jersey: George Washington Bridge, 6.6 miles away.